Did you know that National Ice Cream Day was first declared in 1984? This year we celebrate all things ice cream on Sunday July 15th. Ice Cream is simple, sweet and enjoyed by millions of people every day all around the world. People are passionate about their favourite ice cream, and that is why we have been committed to bringing you the same traditional recipe for the past 70 years. Our ice cream is made with local cream and dairy ingredients produced by dairy farmers in Ontario. Our products proudly bear the “Quality Milk” logo indicating that all of the milk ingredients used are 100% Canadian. This National Ice Cream Day as we celebrate our favourite cool treat, lets also celebrate the Canadian Farmers who play a key role in bringing us the quality ingredients necessary to produce Shaw’s Ice Cream. 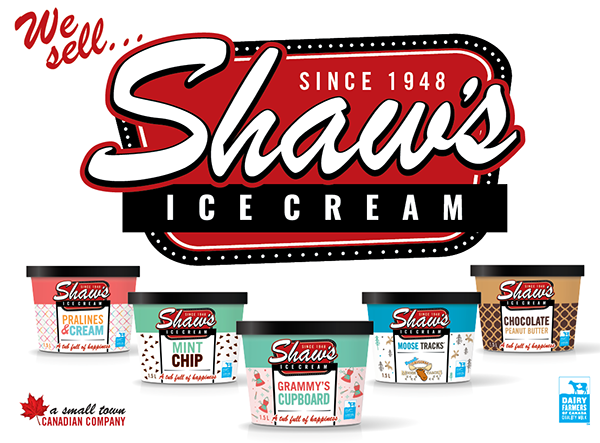 Thank you for supporting our Canadian Dairy Industry and Shaw’s Ice Cream, “a small town Canadian company”!